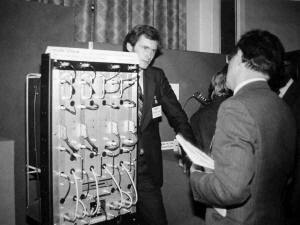 The picture shows me demonstrating the Silver Streak Transposer at a Designs Department Exhibition in 1980. I think that this was the Department's only full scale exhibition involving all of the Sections, and it was a great success. It was held in the Langham (now The Langham Hotel), just across the road from Broadcasting House. After three years at Daventry transmitting station, I joined Designs Department as a Laboratory Technician in 1970 and left in 1985 when I was Head of Transmission Section. Johnny Johnstone was on my interview board and he gave me the opportunity to join the Department. I worked in RF Section for several years under Johnny’s inspirational leadership and I remain extremely grateful to him for the encouragement and guidance he gave me. After leaving Designs Department he became an academic at the University of Surrey, but he always had professorial tendencies. On many occasions he approached me in the laboratory to discuss my project and he filled sheets of paper with almost indecipherable mathematics. Handwriting was not his strong point, but his engineering and mathematical guidance was well worth studying, which I usually did when I got home. This was undoubtedly good for me professionally, but sometimes I couldn’t take in any more and tried to discourage Johnny’s visits in the laboratory by barricading myself in with large quantities of test equipment on trolleys! Johnny did particularly well at securing funds for radio frequency test equipment (which was very expensive) and by the late 1970s the RF laboratory was an Aladdin's Cave with all sorts of wonderful pieces of technology such as spectrum analysers, network analyers, modulation analysers, tracking generators, power meters, frequency synthesisers etc. However there was only one spectrum analyser which we had to fight over when I first started there and the only calculator was a large electro-mechanical device. RF design engineering in those days tended to be something of an art, because the tools were not available to provide precise modelling of components at the high frequencies involved. On the other hand, the theoretical calculations involved with designing filters and matching circuits etc are very complex. I was particularly keen on using computers to minimise the uncertainties and I think I was amongst the first in the Department to do so. I was not clever enough to write the programs that manipulated S-Parameter matricies etc. but this was done by David Boughton, a very good mathematician who set up the Department’s Computer Unit. My role was to use these programs to calculate and optimise component values, including the dimensions of transmission lines fabricated on special printed circuit boards made with low loss dielectric that had a well defined dielectric constant. One of my first designs was a frequency synthesiser for use in a TV transposer that was nicknamed the "wine press" because of the way that all the RF modules were clamped together. I think it was the first RF frequency synthesiser in the BBC and Johnny Johnstone decided that I should present a paper on it at the Institution of Electrical Engineers. I was only 23 at the time and in awe of the achievements made by other engineers working in the same field, so it was with great trepidation that I stood on the stage at Savoy Place in front of a couple of hundred people, with a portrait of Faraday looking down on me. However I got through it and was grateful to Johnny for giving me the experience. 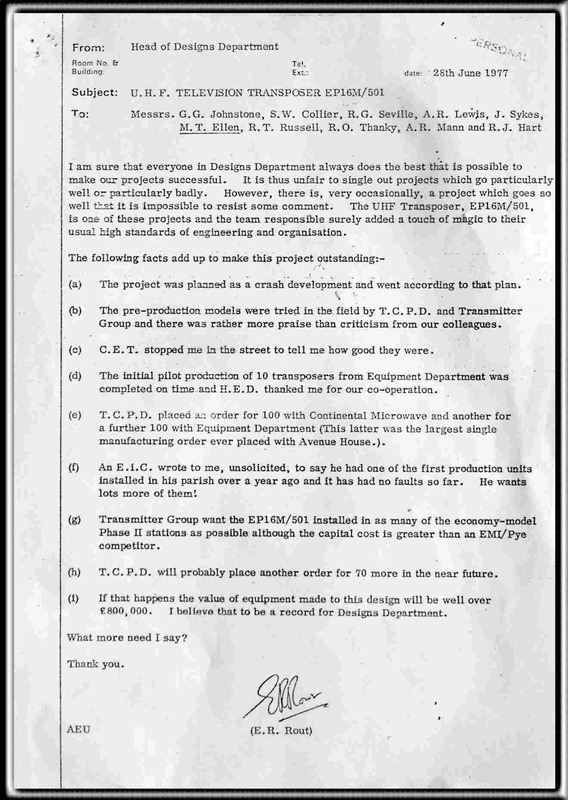 After promotion to Design Engineer I worked in the “Blue Streak” transposer team led by a very nice chap called Stan Collier. When these transposers started to go into service, Stan took the whole team for tea with the BBC’s Director of Engineering who, along with HDD and others, thanked us all for the work that we had done. This fairly unusual event was much appreciated and undoubtedly influenced my management style in later years. The Blue Streak looked very strange and was made with several, specially designed, cast aluminium boxes bolted onto a vertical metal sheet. They were all blue hence the name, coined by someone from Transmitter Department. I think that it was the World’s first UHF TV transposer to use broadband modules that could be set to transpose between any of the required channels simply by connecting them to passive components that set the frequencies. This had significant operational advantages and proved to be very reliable. In fact I believe that about 600 were still in use some 30 years later. I designed the 50dB gain, 2Watt power amplifier, but even though I used state of the art transistors in the output stage they only gave about 3dB gain which is very poor, but it was an interesting challenge to get the most out of available technology. I enjoyed using Smith Charts (see picture) and computer aided design during this project. I hope that John Sykes will describe his frequency synthesiser design for the Blue Streak because it was a very imaginative and well executed piece of work. Meanwhile, Robin Caine was leading another team in RF Section that designed a “Comprehensive RF Test Set”. It was an amazing design that greatly reduced the amount of equipment that the BBC’s transmitter maintenance teams needed to take to transmitter sites. The problem for me was that by the time I joined the project most of the other modules had been designed and the estimate I’d given for the space I needed was too optimistic. My earlier frequency synthesiser work put me in line to design the synthesiser for the RF Test Set, but this time it was much more difficult, due to higher frequencies (up to 1.4GHz), temperature range requirements and lack of space. I found it particularly difficult to get the phase noise low enough and it was never really satisfactory. I worked long and hard trying to get it right and all my colleagues were very helpful and supportive, in particular Laboratory Technician Steve Bowling who did a great job and was very patient with me. I really suffered on this project and I was not proud of the end product. The maintenance teams had to put up with my synthesiser until Bill Murray designed a replacement several years later, allowing the Test Set’s many good features to come to the fore. Bill had the benefit of new components, but success was mainly down to his design ingenuity. I needed a change and moved to Transmission Section where I thoroughly enjoyed designing the Department’s first digital test generator in 1976 (GE7/1, see picture). It simulated a PCM coder, producing precisely defined waveforms that were used to align the PCM decoders at the main FM transmitting stations. Entirely made from digital logic, it was a refreshing change from RF. Once again, it had to fit it in a small space and this was achieved through the expertise of Laboratory Technician Neale Davison. In 1976 I was asked to investigate a problem with new cameras being used by BBC Outside Broadcasts and I found that picture defects were being caused by impedance mismatch problems. While investigating, I had to almost completely disassemble one of their brand new and very precious cameras, to get at the interface for the camera's triaxial cable. I am no stranger to taking things to pieces, but I was very relieved when I got it back together and working again. During another project for OB's (feasibility study for a new communications system), I spent a day with the OB crew at Ascot, so I put a bet on at lunchtime and my horse came in at 5 to 1. A profitable job! Around this time I got involved with seminars that the Department put on for various groups of visitors and I devised a party piece that demonstrated several of the Section’s achievements. I used the “Carrier Equipment” to frequency division multiplex a 13 Channel PCM coder and baseband video with Sound-in-Syncs, then I passed the whole signal through an almost invisible optical fibre. I proved that I was not cheating by pulling out the fibre to stop all the sound and picture. Optical fibres were fairly new in 1977 so this created quite a lot of interest. Microprocessors were just beginning to appear and Richard Russell of Monitoring & Control Section produced the first working design that most of us had seen. The Department benefited greatly from the enthusiasm of staff who developed expertise working on their own personal projects outside work, and this was a prime example. I was so impressed that, as a small official project, I built a demonstration microcomputer based on Richard’s design and helped a number of people in the Department to understand the basics. For some years I had been envious of the people working in Monitoring & Control Section, so I was delighted when I managed promotion into the section as a Senior Design Engineer. They were a very clever lot and their strongly held views made life fairly dramatic at times. The other, far more experienced, Senior Design Engineer was David Carter and he was leading pioneering work on the development of Monitoring & Information Centres (for the transmitter network). I did various fairly small projects including a unit (CO8/5) that would fit into any of the Automatic Fault Reporters installed at transmitting stations, and it enabled measurements of signal quality to be signalled back to headquarters. Designs Department, in particular David Savage, had done a lot of work to establish satisfactory picture quality throughout long and complex distribution paths, but station visits to check for variations over time were expensive and time consuming. By fitting my unit at the ends of major chains it was possible to track any performance variations more easily. The benefit for me was visiting, Shetland, Isle of Lewis, Northern Ireland, Wales, Devon and Jersey to install the units and make tests. These trips in 1978/9, with Tim Cook of Transmitter Department for guidance, were most enjoyable. After quite a struggle, I felt that I was beginning to be accepted in M&C Section. Then one day I was called to see my Group Head David Kitson and Johnny Johnstone. Following the success of Blue Streak there was a requirement to design a successor and they asked me if I would be willing to lead the project. Having previously done a long stint in RF, really I wanted to move on, so I said no thank you. I knew that I was pushing my luck and I felt rather bad about it after all the mentoring I had received. So, the next day when Johnny had a quiet chat with me I changed my mind. In fact David was offering me a marvellous job and it was foolish of me to be difficult about it. I knew exactly who I wanted on the team and I got them all. Rhys Lewis designed the IF unit and Bill Murray designed the frequency synthesiser. 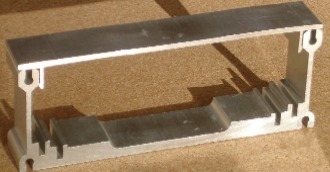 Jack Hart designed the physical housing in conjunction with people from Services Section, including a special aluminium extrusion (see picture). He also designed the comb line filters with consultancy from John Sykes (who was leading a very successful VHF/FM transmitter project at the time). Other engineers, technicians, drawing office and model shop staff joined the team when necessary. They were all first rate and the end result, in 1981, was very good. Compared with the successful Blue Streak, this new “Silver Streak” transposer had to be better than half the cost, half the size and half the weight. This was achieved by a significant margin and it was far more flexible operationally. I believe that about 750 were still in use some 25 years later. Meanwhile, back in Monitoring & Control Section, David Carter had developed a leading-edge distributed microcomputer architecture for the control system of a big HF transmitting station at Woofferton. His team included Richard Russell, David King, Nick Cutmore and John Went, who also contributed a great deal to this very successful project. I moved back to Monitoring and Control Section and my job was to lead the team to automate the control system at the Skelton HF transmitting station. In some ways my job was easy because the basic design had been done for Woofferton, but it was quite educational from a management perspective. I didn’t know nearly as much as the others about the intricacies of the microcomputer system, but I tried hard to reconcile all the strongly held views and it was very satisfying to see the team achieve another conspicuous success. In 1983 John O'Clarey, the Head of Transmission Section retired and I replaced him. The section was doing all sorts of interesting work including NICAM, Dual Channel Sound-in-Syncs, 68PAL and digital OB multiplex. Robin Caine was the leading light on Designs Department’s development of NICAM, but it was David Savage who invented this acronym, which later became well known to the general public. It stands for Near Instaneously Companded Audio Multiplex and originally referred to a system used for internal contribution and distribution circuits. A variant with more error protection and a slightly higher bitrate was developed by BBC Research Department for broadcasting stereo sound with television and it is this system that made NICAM so well known. Dual Channel Sound in Syncs also used NICAM coding and for this project we pioneered the use of ASICs (Application Specific Integrated Circuits) in Designs Department. After investigating several possible suppliers we selected LSI Logic and Duncan Nightingale did a splendid design job, under the guidance of John Robinson. Digital video coding has come a long way in 20 years, but in 1984 it was quite an achievement to reduce the bitrate to 34Mbit/s and retain broadcast quality. In partnership with Research Department, 68PAL was developed in Transmission Section by Rhys Lewis and David Birt. Owen Cullum, a young engineer who was studying digital filter techniques at college, used his new found expertise to develop a replacement for an old and very useful design for Outside Broadcasts. It enabled up to five low bandwidth audio channels to be sent over a single music circuit, using frequency division multiplex. The original design was full of inductors and capacitors, but Owen’s design used analogue/digital conversion with all the processing carried out in the digital domain.